The yarn that came with this kit is called Sprightly, which I had never heard of, but it got very good reviews so I was excited to give it a try. This ecru Sprightly yarn is 100% acrylic and so soft and luscious. It was a real pleasure to work with. 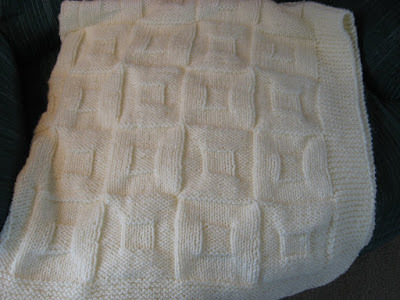 The pattern, Square Within a Square, is a simple combination of knits and purls. Once the garter stitch border was done and the pattern was set up using stitch markers, it was a very simple pattern to work without a whole lot of thought. Perfect for relaxing on many cold winter nights while enjoying a movie or visiting with family and friends. The blanket finished at about 40 inches square, a very generous size for a baby to be able to use for a long time. This particular blanket was delivered last week and will be given as a baptism gift for a baby girl whose two great grandmothers were friends of mine for many years and who have both passed. I know that, if they were still living, they would have pulled out their own knitting needles and made something just as special for this little baby. It was truly an honor to be able to make this blanket in their place. Have you used your hooks and needles for any long term projects lately? Or do you prefer the instant gratification of quick projects? Next time, I'll show you a very quick project I did recently as a matter of necessity. The baby blanket is so pretty. Some of the blocks look almost like thread spools. I have both long-term and short-term projects in the works and enjoy both. 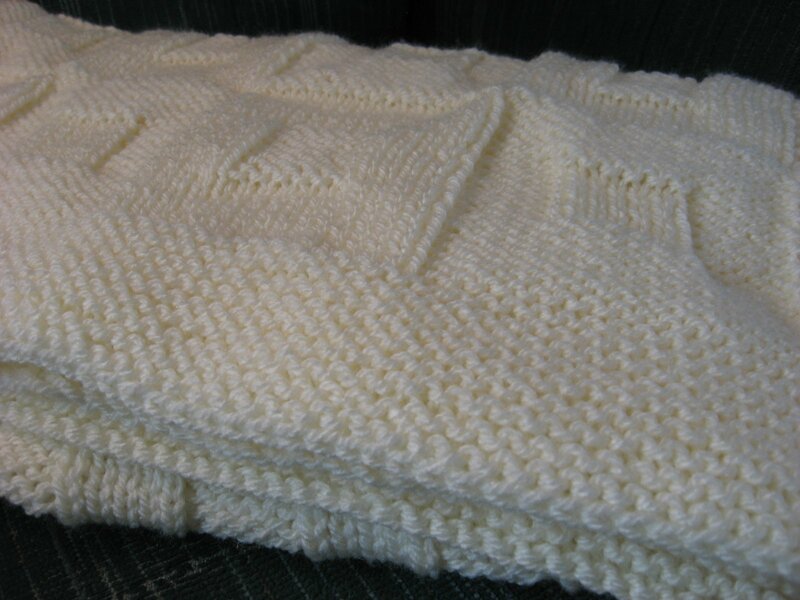 Beautiful blanket - perfect Baptismal gift. Hope you and your family have a glorious Easter holiday!